Today's prompt is a very important one :) This is actually an activity that I used to make all of my second graders do (before I became an art teacher). This one is very special and hopefully, something that you will treasure for a long time. What a wonderful letter.....and a great idea! P.S...all those things you said in your letter are true! I love this. I look forward to sitting down and telling myself how wonderful I am. 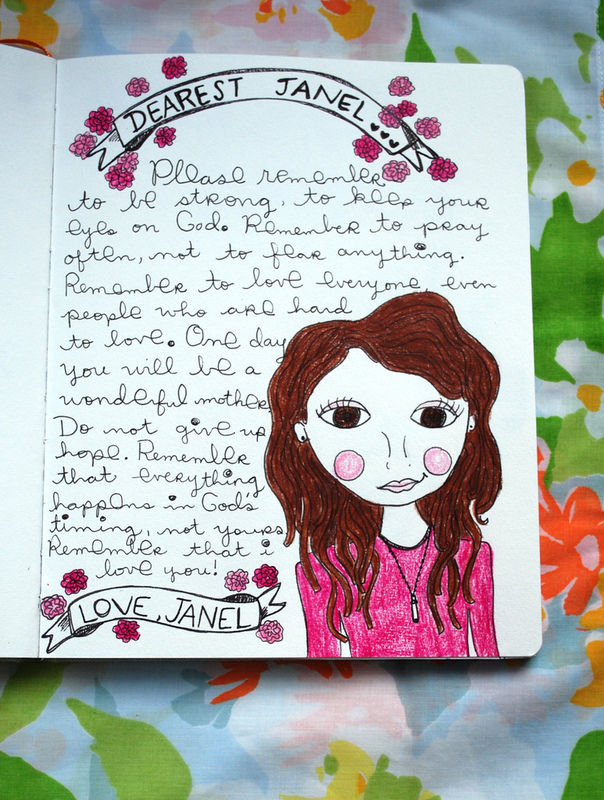 I just posted two more of my journal pages on my blog! that was so inspirational.. love the idea of the journalling will do it in the summer though cause i HATE exams--- school. I love the drawing of yourself! It's so perfect and so is the letter! very inspiring! we don't tell ourselves these things enough. Page 6 is done! I totally wanted to copy your idea of the banner but decided against it. Maybe in another prompt though?? Haha. I'm struggling to remain original seeing the amazing pages people are making! All your ideas seem so good in comparison with mine, but I'll preserve.